Burgers stuffed with mozzarella cheese and proscuitto served on a bun smothered with homemade basil mayonnaise. Take ground beef in a mixing bowl and hand mix together with beer and salt until completely absorbed. Make four balls out of the ground beef and set aside on a cookie sheet that has been covered with wax paper. Chop the proscuitto into small pieces and separate into four equal piles on the cutting board. Take 1 slice of mozzarella cheese and add one of the proscuitto piles into it. Wrap the cheese slice around the proscuitto and gently squeeze together the pocket in your hand so it doesn't come apart and the proscuitto stays inside the cheese. Make four balls using all of the proscuitto and cheese. Next, take one of the ground beef balls and push your thumb into it making a large hole to put the proscuitto and cheese ball. Once you put the proscuitto/cheese in the ground beef, carefully shape the beef into a patty making sure the proscuitto and cheese are completely covered and inside the beef. Complete the rest of the patties using the same method. Put the patties on the grill set to medium high heat. Keep grill closed with patties cooking for 7 minutes. During that time, finely chop the basil leaves in a food processor. 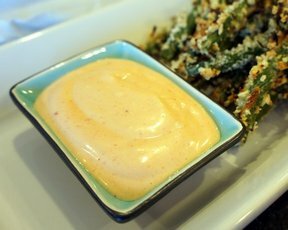 Mix the finely chopped basil and mayonnaise and put in the fridge. Turn the burger patties over and cook for another 7 minutes in the grill in order to get medium temperature meat. Grill longer if you prefer medium well or well done. 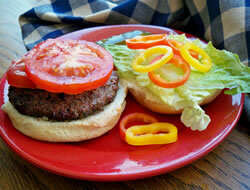 Put burger patties on buns and add the basil mayo along with any other condiments that you may like. Take a big bite and ENJOY! !